The eurodollar era saw not one but two credit bubbles. The first has been studied to death, though almost always getting it wrong. The Great Financial Crisis has been laid at the doorstep of subprime, a bunch of greedy Wall Street bankers insufficiently regulated to have not known any better. That was just a symptom of the first. The housing bubble itself was more than housing. What was going on in the shadows wasn’t bounded by national borders or geography. Some called it “hot money”, to others it looked like capital flows. To Ben Bernanke, he didn’t know what it was, either, enough of it to say that there was something taking place out there beyond the US boundary. 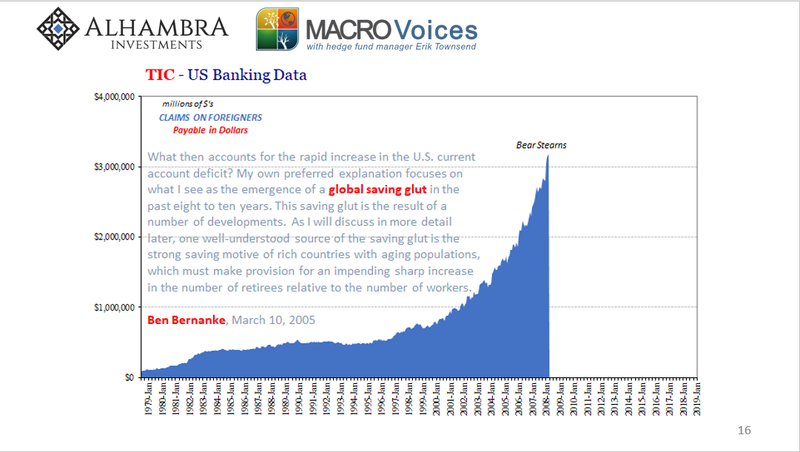 Bernanke in 2005 called it a global savings glut. If only he had known better; it was his job to know better. On August 9, 2007, this double bubble came to a screeching halt. The monetary mechanism behind the credit-fueled global imbalance had reached an irredeemable milestone. There was simply no going back. But that wasn’t a realization which came all at once; momentous paradigm shifts never take place in the blink of an eye. These are drawn out processes, to challenge especially multi-decade assumptions embedded within the very fabric of how things work; or how they were thought to. If 2008 was a big gaping wound to that system, it was 2011 which struck the fatal blow. It’s not easy to put it into very simple, straightforward terms; there was more than one thing wrong with it, and as any “great” occasion it was multiple failures stacked on top of each other. What were thought to be comforting redundancies turned out instead to be destructive bottlenecks, the erasing and rethinking of numerous dimensions spreading out over time. What was it that happened? As discussed, the shocking speed of illiquidity which was thought impossible given those presumed redundancies (I went over several of them, in detail, in Eurodollar University). It culminated in Bill Dudley’s perfect summation given at the FOMC meeting right after JP Morgan reluctantly, and with a lot of assistance, “rescued” Bear. In some ways, the policymakers at the Federal Reserve heeded this very lesson – though, obviously, not well or thoroughly enough. The central bank would increase its level of creativity, but always, always keeping to the same orthodox Economics viewpoint. They were stuck in a 1950’s monetary assessment trying to force it into a very 21st century shadow money regime. That even the innovative emergency techniques weren’t working became clear enough by the end of 2008 (by then it wasn’t exactly subtle, their failure). Thus, TARP and especially QE. The former became a blanket throw-it-at-the-wall-and-see-what-sticks approach, the government spreading bank “capital” into as many places as possible to try to stem the banking system’s ongoing, unstoppable reverse. The latter, QE, was a more refined liquidity approach. Or at least that’s what its practitioners felt. 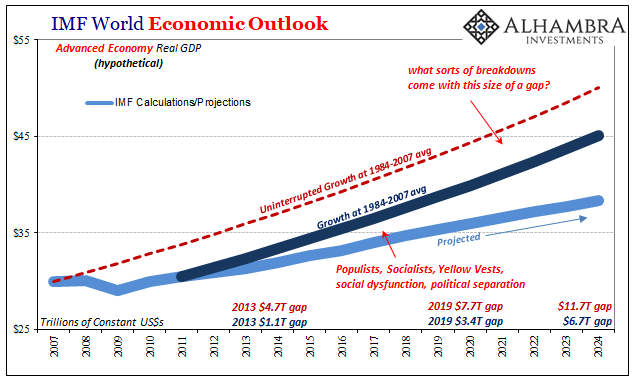 The Fed would try to use its own balance sheet, and the offshoot of bank reserves running into the trillions, to finally satiate a more and more illiquid system truly wrecking the global economy. With the introduction of QE (following the vastly more important adjustment to FAS 157, or mark-to-market), banks did give it a go, willing to give it a chance and see what would happen. They weren’t really sure, either, if bank reserves were a sufficient answer to what had become a system breakdown. In the immediate aftermath, it made something like a recovery in money therefore economy but not quite all the way. Like 2008, the story of 2011 is written by the people who’ve never glimpsed the shadows. Officially, Greek debt became the new avatar where subprime used to be. It was no more about Portugal and Italy than 2008 had been about US McMansions. Again, it is a complicated set of arrangements, but distilled into its very essence the thing was bank reserves. 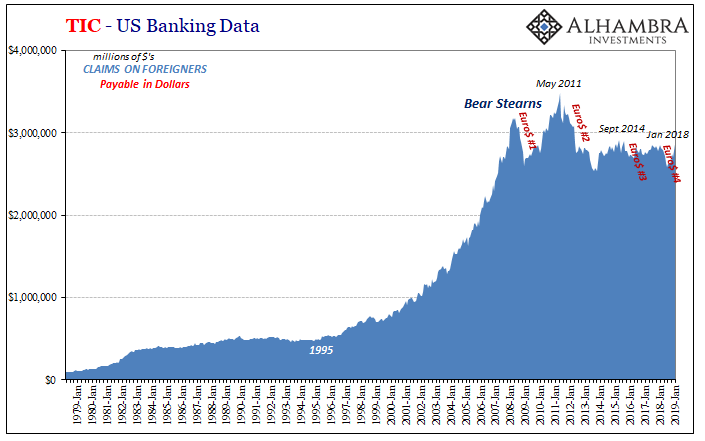 If the global banking system had hoped QE’s increase in them was the answer to everyone’s fear, that the trillions of them would act as insurance against another Bear Stearns, they were very disturbed to find out that, no, bank reserves did not fill that role. At all. Through two QE’s to that point, the Fed had added $1.6 trillion in bank reserves where before 2008 there were practically none. It seemed like a lot, far more than what would ever be necessary. Put yourself in the position of a bank which went through the Bear Stearns (and then Lehman, AIG, Citi, etc.) scare just two or three years before; a firm that in a matter of three days went from alive if troubled to out of business. Now, you gave the Fed a chance to fix that problem with nearly two trillion of bank reserves, and then, again in a matter of a couple years, right back to the same warning signs observed in the weeks and months before Bear went down for good. As I write often, you don’t need an LCR to completely change your behavior realizing what really had happened. The global banking system gave the Fed a limited window to fix things. Instead, officials showed the banking system QE and bank reserves (a puppet show). All these central bankers did was prove they had, and have, no answers. 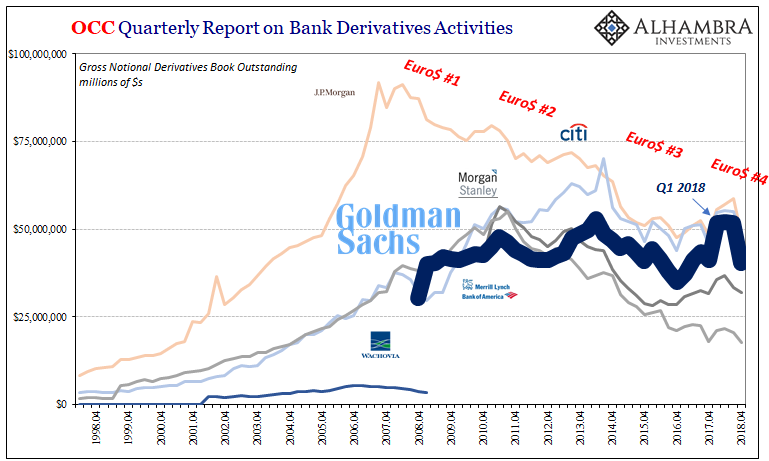 Banks have been studiously shrinking ever since, only a few like Goldman or Deutsche Bank “brave” (read: stupid) enough to wade back into those money dealing activities – only to get burned every time in a renewed eurodollar squeeze which happens regardless of how many bank reserves there are. The risk-takers are the outliers, and always regretful at that. What the eurodollar system gave the global economy (extraordinary lift), following 2011 it has taken it away (persistent drag). Nowhere is that any more evident than in the EM economies, the twin offshoot to the US “subprime” bubble. Before this shadow money system kicked into high gear around the middle nineties, EM growth was barely enough to keep impoverished systems above the water line. By 1995, things began to heat up both in US housing as well as “overseas” economics. 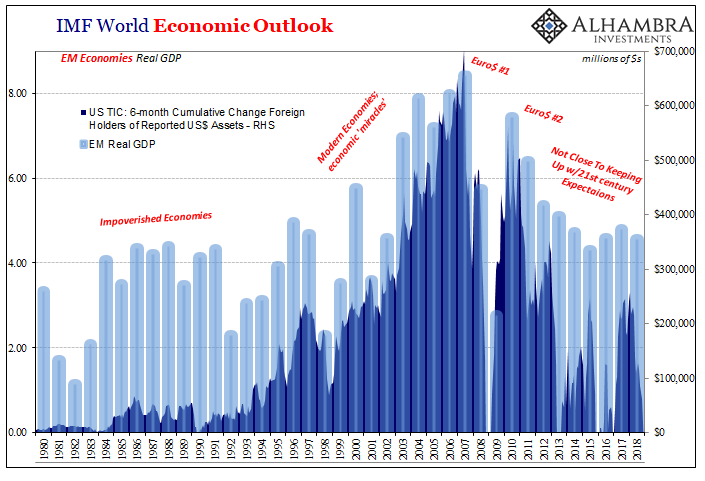 Interrupted by the first eurodollar issue (the Asian flu) as well as the dot-com recession, by the mid-2000’s these places were, seemingly, downright unstoppable – China at the forefront of what was going to be a very different global economic order. 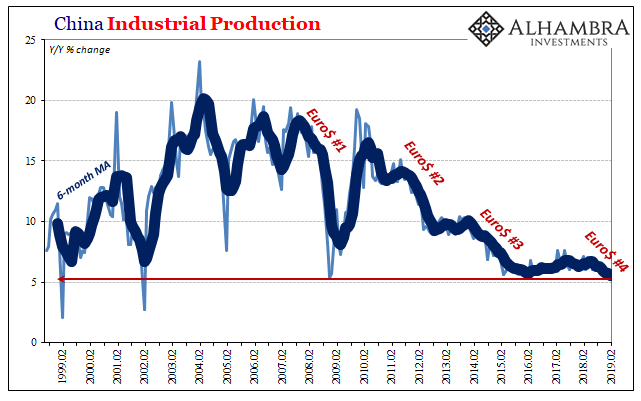 Despite initial claims of decoupling in 2008, these same economies could not withstand Euro$ #1. Though they succumbed to it, they initially came roaring right back. 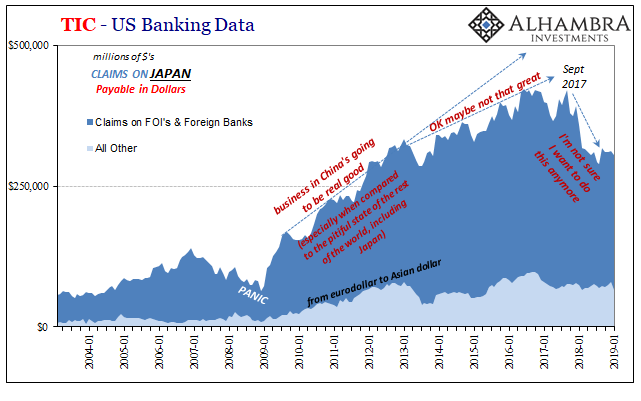 As banks were somewhat willing to give the Fed a chance with QE, they were more willing to give it a go in Asia (largely via Japan). But not after 2011. 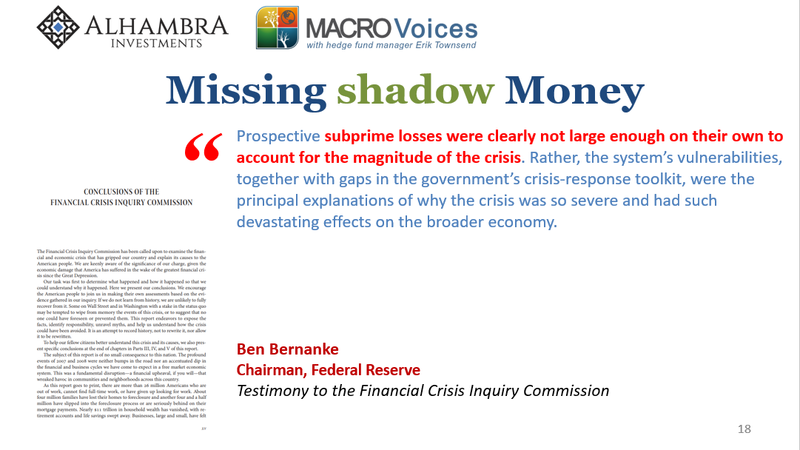 It was just too dangerous, a clearly sickened shadow system the various central banks around the world proved they would not try to understand (let alone solve). From there it became self-reinforcing; the EM’s began to slow, confirming the prudence of monetary withdrawal (more risk, less opportunity). Now as EM growth recedes back to its previous baseline, so to speak, it doesn’t do this on neutral terms. The people living in these places came to expect these economic miracles as a given, transformation to a wealthy society a foregone conclusion. As detailed earlier today with regard to the post-2011 gap among the advanced economies, if the difference between 3.05% and 1.87% is an immense chasm, what do you call for EM’s on the whole the difference between 7% and 4.2%? Massively reduced growth plus now immense debt equals run for the hills (I’m only slightly exaggerating, especially given the eurodollar view from Tokyo). The 2011 eurodollar break, this Euro$ #2, obviously hasn’t gone unnoticed in the developed world. 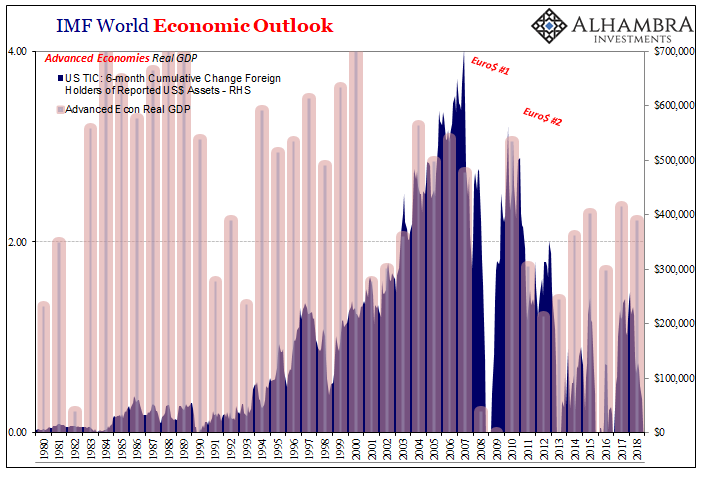 It had much less of a noticeably positive impact before 2008, but in the absence of smooth monetary function the drag of tight global money has been observably unambiguous – and just as dangerous especially as 2019 gets started under Euro$ #4 in place of what the next step in globally synchronized growth was supposed to be. The slowdown which emerged in 2012 is observable practically everywhere around the planet. Worse, it has proven unbreakable, at least as far as central bankers and their 1950’s view of money and economy (closed systems). That was it, 2011 the last chance to undo the example of Bear Stearns, the point of no return should they not put right this shadow money stuff. What banks took from it was surrender; a risk/return profile so skewed that the only wise course no matter how many QE’s is a high degree of economy-harming liquidity preferences. Those few who dare to dabble in risk come crawling back to the bunker before long. Periodic reflation never sustained recovery. The liquidity lesson of Bear Stearns remains the overriding property of the global money system as reinforced and really driven home by 2011 experience. 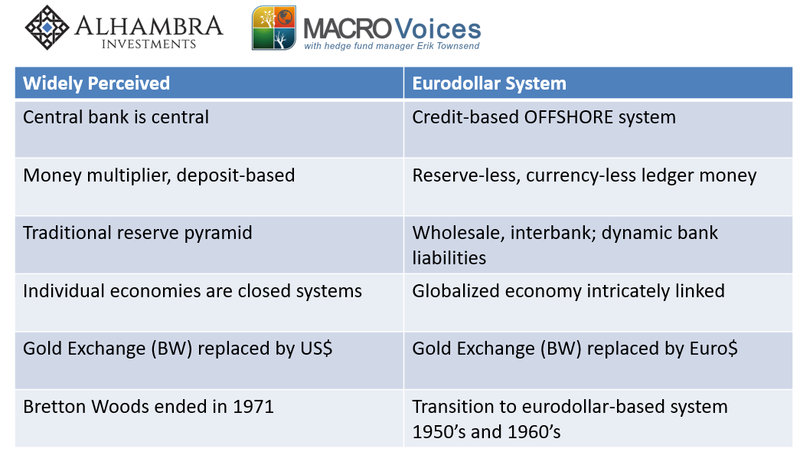 The eurodollar is the world’s true reserve currency, therefore problems in it are going to be problems shared by the whole interconnected global economy. Getting 2011 right, understanding what was a fatal error, that’s how we get out of this mess. Unfortunately, as Japanese experience dictates, our own QE24 is right now far more likely. If we can get that far first.